This is a wonderful new boucle' tweed, Chanel-style, with vivid coloring including shades of creamy ivory, pink blush, gold, etc. (PANTONE 13-1011, 12-1212, 13-1014, etc.). 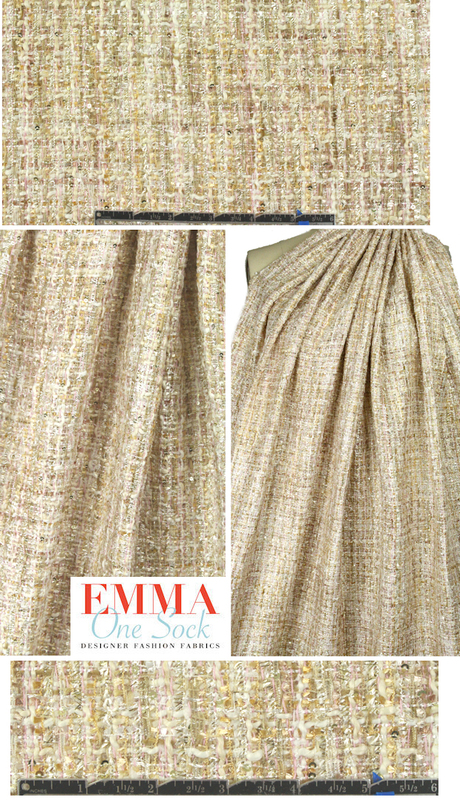 It has fibers of varying thicknesses and textures as well as occasional sequins woven in an intricate basketweave. It is a malleable suiting weight with body in the drape, suitable for jackets, suits, skirt, etc. Line with charmeuse or Bemberg. Dry cleaning recommended.